We know as well as anyone that picking products or services from the web without any previous experience can be a bit hit and miss! But we'd like to think that booking The Animal Experience for your event is a safe bet :-) We have over 24 years of experience and more than a thousand satisfied customers -- indeed, much of our business comes from repeat bookings and personal recommendations. Many of our customers are kind enough to take the time to write and express their thanks, and we've included just a few of these messages below so that you don't need to take our word for it. Many more reviews have been posted on Facebook and Trip Advisor. Please click on the links at the top left of the page to read them. We are delighted that so many people rate us 5*. We think we have the best job in the world and love working with these wonderful animals and we enjoy passing this enthusiasm on to our customers. Please contact us to find out what we can offer, and hopefully you will soon be able to add your event to the ever-growing list that have been enhanced by a visit from The Animal Experience! Geri Haliwell (and her daughter Bluebell) enjoyed meeting our animals at a fundraising event for the Jewish Deaf Association. Filming with Ben Fogle and Michelle Collins for UKTV Eden Channel at the Royal Opera House. 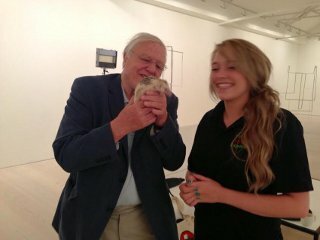 Filming with David Attenborough for UKTV Eden Channel at The Sachi Gallery. 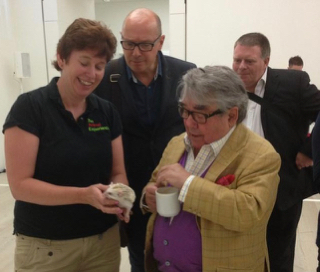 Filming with Ronnie Corbett for UKTV Eden Channel at The Sachi Gallery. "My husband booked me in for both the meerkat and reptile experiences as a surprise for my birthday … wow! I loved it so much! Buster, who showed us around, was so knowledgeable and clearly has a passion for animals himself. Holding all the different kinds of reptiles was incredible (I basically said "it's so cute!" at everything) and meeting the little meerkat gang (where one crawled up and stood on my shoulder!) was such good fun. The commitment to providing all of the animals with the best possible care did not go unnoticed. Thank you so much for a very memorable trip!" "Amazing! Everyone there seemed very friendly and full of knowledge! We did the reptile holding experience which was brilliant! Held a range of snakes and lizards - and was also given facts about each species! Would definitely go again!!!" "Thank you for the most magical afternoon! Can't recommend you all enough!" "Amazing day today for all the children, Mitch. Your talks were informative and I know both staff and children learnt so much. KitKat made a little dream come true, thank you for the cuddles. Highly recommend organising a day with Animal Experience to come into your school. Thanks again." "I just want to take this opportunity to say thank you for the work you did in Longfields School today. The children were just so excited by what they had seen and it has really helped set them up for a fantastic term of rainforest work. Your knowledge and wonderful ease with which you interacted with the children was fantastic and we will definitely be booking you again in the future." "The Animal Experience visited two year four classes in Cardiff! Was the best day ever. Children thoroughly enjoyed getting up close and personal with the animals. Would recommend to everyone. Thank you so much." "I just wanted to say a huge thank you for Monday's event. The feedback has been brilliant both staff and students had a great time, and there was a huge sense of accomplishment from those that faced a fear, as well as excitement to meet such wonderful animals. Everyone thought you were fantastic, Mitch! You were so calm, kind and very knowledgeable. The way you were able to alter your level of delivery depending on the groups we had in was brilliant, it is clear you understood your audience and for us that just made the day better! We are very keen to have another event next year - with more animals and much longer with you! The day just felt too short. When my learners asked me if they could put this event on I was very cautious, but I really needn't have been. We would highly recommend you to everyone. Thank you also to Kayleigh who has been patient and helpful during the planning process!" "Very professional, great knowledge of the animals, animals look really happy and healthy and the Animal Experience team that came to our son's birthday party were brilliant!" "Had a very nice letter from Bayblake school saying what a fantastic day you provided, with the Meerkats stealing the show! Thank you for your hard work:)"
"I would love to say a MASSIVE THANK YOU for coming along on Saturday! It was so wonderful to have you guys and bring the animals. We had really great feedback from parents and children and they obviously couldnt get enough of it with people queuing to see and pet them. The talk/display at the end was really fascinating and I learnt some new animal facts, which was fabulous. I think my favourite moment was popping my head behind the screen to suddenly see the [Tegu] strolling around the Chancel (the aisle and space around the Altar), free as anything, like he owned the place! It was a moment of how great it was to have you over and how a church can be used and open for such things! We are so thankful for your being part of us last Saturday. You made it really special."